A good year-round opportunity for fun. Easy access only about a mile off the pavement. After passing STRAIGHT through Three Lynx, climb to the saddle. The trail is on your left. If you drive downhill at all you have gone too far. There is usually year round access to the trailhead. As the trail leads to the high country you will encounter snow at some point during the Winter and early Spring. An effort is made to keep this trail clear of fallen trees and debris to the snow during the Winter. This is a great way to access the high country by foot rather than miles and miles of gravel road driving. The trail also clears of snow weeks before the 4635 road. Cache Meadow Trail 702, Grouse Point Trail 517, and indirectly Rimrock Trail 704.
follow the old road up the bank about 50 feet. A trail departs on the right. Follow this trail up to an old railroad grade. Turn right and follow the grade about half a mile passing an alder bog on the right. Just past the bog as the grade tends right look for a trail going up a shallow draw to the left. Climb up to the improved Pipeline Road and go over the aqueduct (10 foot diameter iron pipe). Cripple Creek Trailhead is on the right. Hiked this trail on 2/10/2016 – Trail in good shape – 12 logs down up until the 4635 road crossing. Most were easy stepovers, but there is one large log down on one of the first rockslides. Hiked the Cripple Creek trail from Three Lynx to Serene lake yesterday. 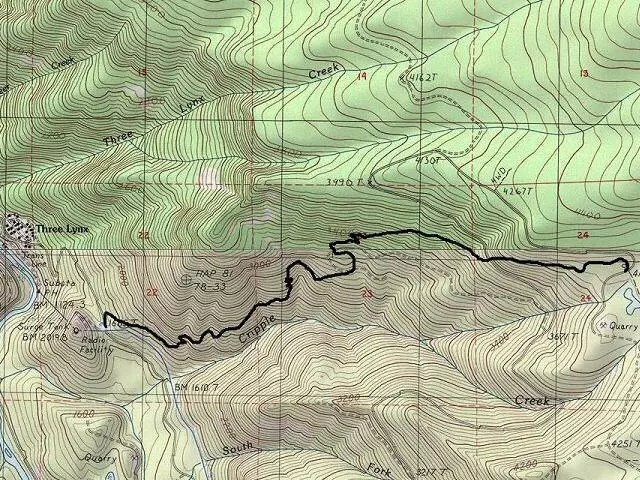 Not sure the last time the Forest Service acknowledged the trail, but my 2003 map doesn’t show it, and it’s obviously not been maintained by the agency for a while. A good portion of the tread has slumped, making for tough hiking, but someone recently logged it out, which helped a ton. Thanks to whoever did it! 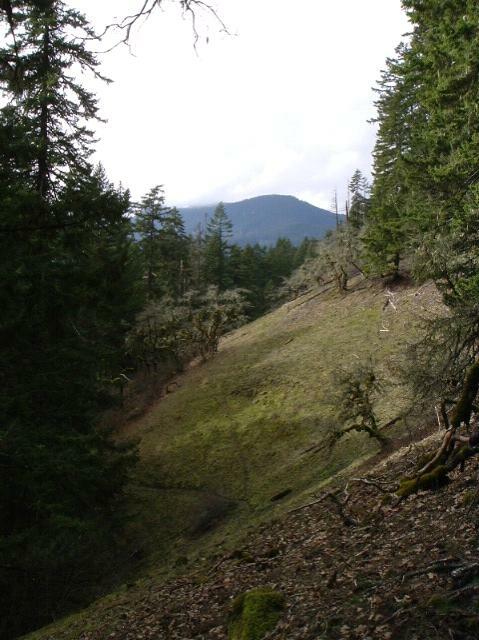 I’ve hiked the area a lot over the years, but never hiked this lower section of Cripple. The big openings with Oregon oak totally made the poison oak I got worth it!